One of the reasons I started this blog is the regret I have for not saving samples or photos of past art projects. Now at the very least I should be able to take a decent photo with my iphone, but my goal is to keep a camera in my school bag at all times. I happened to find these pictures while going through past files of photos on my husband's computer - I work almost exclusively on my laptop. 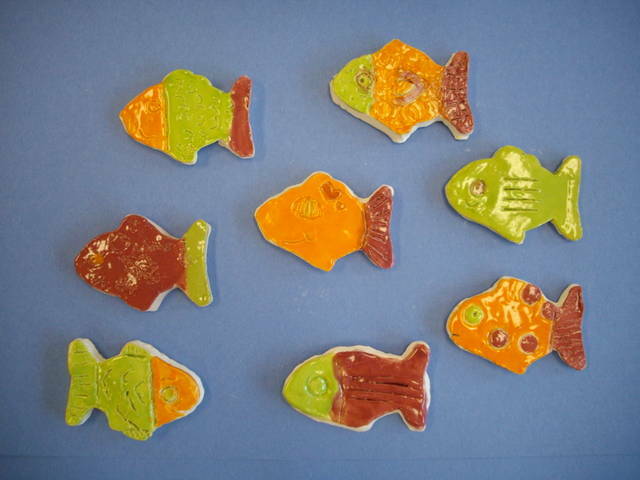 This was one of my first clay projects ever with a grade one class. 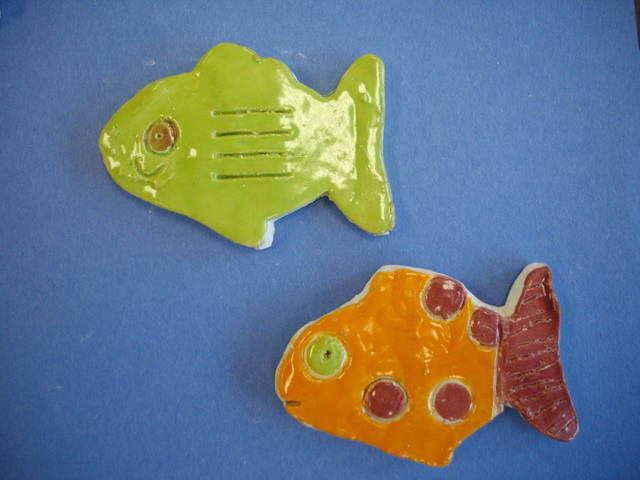 It was a project that would eventually test our school's kiln which had sat dormant in our school for years - until I showed up and learned we had one! This would be a good introductory lessons with clay. After spending some time exploring different texture tools, students would roll out a slab and use a fish cookie cutter to make their fish shape. Using a damp finger they would smooth out any rough edges or cracks. Then they would use the different tools to imprint the details. Before they move their piece to the drying shelf I would use a wooden skewer to print their initials on the back side of the fish. We would then dry our pieces, fire in the kiln, glaze and refire. I always love the surprised expressions on the childrens' faces when they get their first look at their shiny ceramic artwork! They cannot wait to show their parents what they did! Priceless! Thanks! I'm following you too and am also a fellow BCer!